Could Deustche Bank Show Financial Link Between Trump and Russians? Pursuing the Trump-Russia investigation, Special Counsel Robert Mueller (pictured) has subpoenaed Deutsche Bank for data on accounts held by Donald Trump and his family, according to “a person close to the matter”. Germany’s largest bank received the subpoena several weeks ago. The source said key documents had since been handed over. Deutsche Bank has lent the Trump Organization hundreds of millions of dollars for real estate ventures. It was one of the few major lenders that would give large amounts of credit to Trump in the past decade, because of the businessman’s six bankruptcies in his hotel and casino businesses during the 1990s. 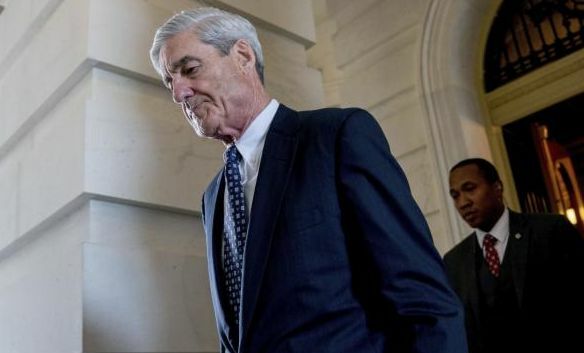 A “US official with knowledge of Mueller’s probe” said one reason for the subpoenas was to find out if Deutsche Bank sold some of Trump’s mortgage or other loans to Russian state development bank VEB or other Russian banks that are now under US and European Union sanctions. If Russian banks do hold the loans, they could constitute leverage by the Kremlin and other Russian actors over Trump, both as a candidate and as President. Trump had liabilities of at least $130 million to Deutsche Bank Trust Company Americas, a unit of the German bank, according to a federal financial disclosure form released in June. The debts include a loan of more than $50 million for the Old Post Office, a historic property turned into a Trump hotel in downtown Washington; mortgages worth more than $55 million on a golf course in Florida; and more than $25 million on a Trump hotel and condominium in Chicago. All of the loans were taken out in 2012 and will mature in 2023 and 2024. We have confirmed that the news reports that the Special Counsel had subpoenaed financial records relating to the president are false. No subpoena has been issued or received. We have confirmed this with the bank and other sources. Trump would not answer shouted questions from reporters about whether Mueller had crossed a line with the subpoena, as he appeared with senators at the White House on Tuesday. In a July 9 interview, Trump warned that Mueller should not investigate his finances or those of his family. A spokesperson for the Russian bank VEB said it had not received a subpoena. Deutsche Bank declined to comment. In an initial meeting with three Kremlin-linked envoys in June 2016, Donald Trump Jr. asked whether they had evidence of illegal donations to the Clinton Foundation, according to one of the Russian participants. Lawyer Natalia Veselnitskaya told the Senate Judiciary Committee, in answers to written questions, that she did not have any such evidence. She asserted that Trump appeared to misunderstand the nature of the meeting after his e-mails with the broker of the meeting, music promoter Rob Goldstone, promising incriminating information on Clinton. Veselnitskaya, who has close links to Russia’s Prosecutor General, said that once it became apparent that she did not have meaningful information about Clinton, Trump seemed to lose interest and the meeting petered out. Donald Trump’s son-in-law Jared Kushner and campaign manager Paul Manafort were also at the meeting. Veselnitskaya insisted in her statement that she did not work for the Russian government and was not carrying any messages from Kremlin officials. She said her motive was to get the Trump team to examine the Magnitsky Act, sanctions imposed by Congress in 2012 over Russia’s human rights abuses. The lawyer claimed that there was no discussion of Russia’s hacking or leaking of e-mails, social media campaigns, or any other aspect of Moscow’s interference in the US election. Donald Trump and his son-in-law Jared Kushner plan to recognize Jerusalem as the capital of Israel, moving the US Embassy. The decision, to be announced today, pushes aside 70 years of US foreign policy by effectively recognizing all of Jerusalem — established as an “international” city since the formation of Israel and partition with the rest of Palestine in 1948 — as Israeli territory. Trump’s decision has been driven by a campaign promise to evangelicals and pro-Israeli American Jews to move the embassy. It has been buttressed by Kushner’s lead on US diplomacy in the region, including talks with Israel and Saudi Arabia, which has overridden Secretary of State Rex Tillerson and State Department staff. See Podcasts: Is Trump Going to Fire Secretary of State Tillerson? On Tuesday, Trump set out the policy change in calls with Israeli Prime Minister Benjamin Netanyahu; Mahmoud Abbas, the Palestinian Authority President; and Arab leaders who warned him that it would disrupt the Israel-Palestine peace process and could fuel violence across the region. Late Tuesday, Palestinian national and Islamic groups issued a joint statement calling for three days of “popular anger” from Wednesday throughout Palestine and outside US embassies and consulates around the world. The US consulate in Jerusalem barred employees and family members from going to the Old City or the West Bank, and the State Department urged embassies around the world to tighten their security. “Senior Administration officials” said that the declared move of the US Embassy is largely symbolic at this time, as it will take years to find and develop a site in Jerusalem for the complex. The Trump Administration is considering a plan for a global, private spy network to circumvent official US intelligence agencies, “according to several current and former U.S. intelligence officials and others familiar with the proposals”. The plan has been developed by Erik Prince — the founder of the Blackwater security firm, brother of Trump’s Education Secretary Betsy Vos, and a Trump back-channel for discussion with foreign entities — with assistance from Oliver North, a key figure in the Iran-Contra scandal. The sources said the proposal has been pitched to the White House as a means of countering “deep state” enemies in the intelligence community seeking to undermine the Trump Presidency. They also include spies with no official cover in several countries considered “denied areas” for US intelligence personnel, such as North Korea and Iran. It is a direct-action arm, totally off the books. The whole point is this is supposed to report to the President and Pompeo directly. Some individuals involved with the proposals secretly met with major Trump donors asking them to help finance operations before any official contracts were signed, sources said. But a “current US intelligence official” countered this, saying the proposals were first pitched at the White House before being delivered to the CIA. According to “two former senior intelligence officials”, Pompeo has embraced the plan and lobbied the White House to approve the contract.